Parents and kids often lead parallel lives with work and school leaving only little family time left. 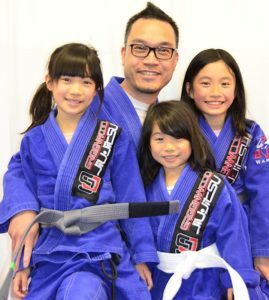 Our family program allows parents and kids to learn Jiu Jitsu while spending time together and improve everyone’s physical fitness in a friendly and safe environment! What are the Benefits of the GBJJ Family Program? Parents participate with their kids during each and every class in a fun and safe environment. We disguise learning with fun game-like drills where kids and parents warm up together then separate to learn Jiu Jitsu techniques. You will understand better how your child feels in a new situation. Young kids are sometimes shy and anxious when faced with new challenges. Your presence on the mat can make a difference and help your child start their journey.